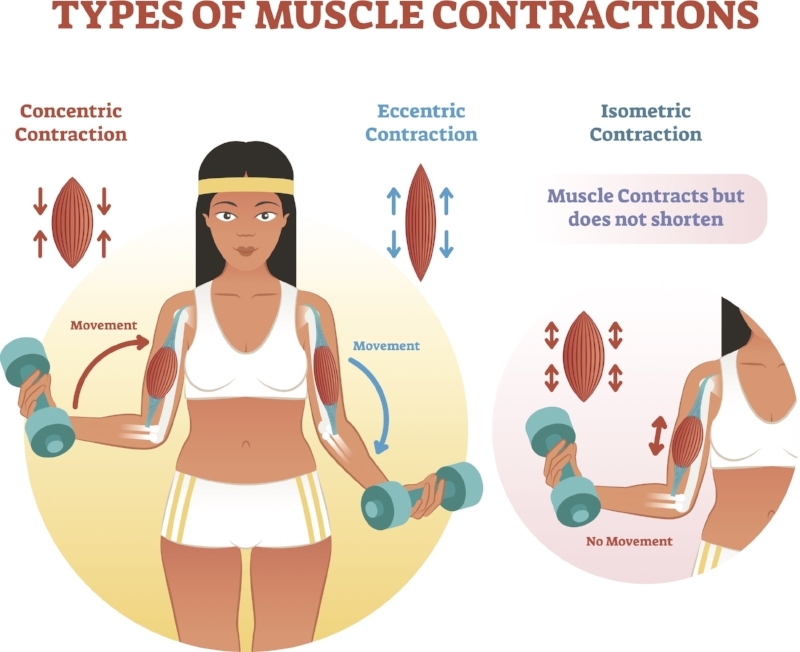 Today we explain concentric, eccentric and isometric muscle contractions, what they mean and where you can find them in your barre class exercises. If you make it to the end, we’ll reward you with $100 off our Barre Anatomy Workshop! A concentric contraction is when a muscle is active while it is shortening under load. Flexing your elbow during a bicep curl and bringing the forearm closer to the shoulder is a concentric contraction for the bicep muscles. If you extend your knee to a straight leg, your quadriceps are concentrically contracting. Barre Training Tip: Flexion typically is concentric in the anterior muscles and extension is concetric for the posterior. One exception is in the knee: the quadriceps concentrically contract to extend the knee, while the hamstrings concentircally contract to flex the knee. An eccentric contraction, often referred to the negative phase, is the motion of an active muscle while it is lengthening under load. This is the slowing down of a movement as when you are resisting gravity like in a squat. Extending your elbow during a bicep curl and lowering the forearm away from the shoulder is a eccentric contraction for the bicep muscles. In a squat or chair position, the quadriceps are eccentrically contracting as the knees flex and the glutes and hamstrings are eccentrically contracting as the hips flex. Eccentric contraction is the stronger load bearing phase of movement, meaning that if you can only pick up a 100 lb box, you could lower a 200 lb box to to the ground. Eccentric contraction is also primarily responsible for building muscle. It’s during the lengthening of the muscle tissue, under load, that the fibers are stressed and then experience micro tears. The tear and repair process is how muscle tissue is build. Barre Training Tip: Because negative load perpetuates a literal lengthening of the tissue, we can simutaneously stretch and strengthen a tight and weak muscle. This is great for the surrounding joints and for helping to restore a healthy resing length in the muscle itself. Isometric contractions do not change the length of the muscle and there is little to no movement of the joint. Holding your elbows bent at a 90 degree (or any degree) angle on the up or the down of a bicep curl or “sitting” and holding in a squat are examples of an isometric contraction. Barre Training Tip: Isometric exercises involve contracting your muscles and pushing against an immovable object, therefore strengthening your muscles with minimal movement and force. Below we break down three Barre Intensity exercises and discuss the specific muscle contractions. It’s worth noting our body is made up of two-jointed muscles that perform multiple joint functions. A flexor/extensor at one joint may also be a flexor/extensor at another. Because these muscles cross two joints, concentric and eccentric contraction is not always black and white. The hamstrings, quadriceps and biceps all contain at least one two-jointed muscle. Sitting and holding chair with minimal to no movement is an isometric contraction for the muscles. Glutes and upper fibers of the hamstrings that cross the hip are isometric in a shortened state. Upper fibers of the quadriceps that cross the hip are isometric in a lengthened state. Hip of the lifted leg remains in extension while knee is flexing and extending. Holding elbows bent with little to no movement is an isometric contraction for the muscles. Assuming elbows remain at the sides of the torso. Take your barre training to the next level and become even better at your awesome barre teaching skills by participating in our Barre Anatomy Workshop. Wondering what our Barre Anatomy workshop covers? Read our blog, Inside Look-Barre Anatomy Workshop.